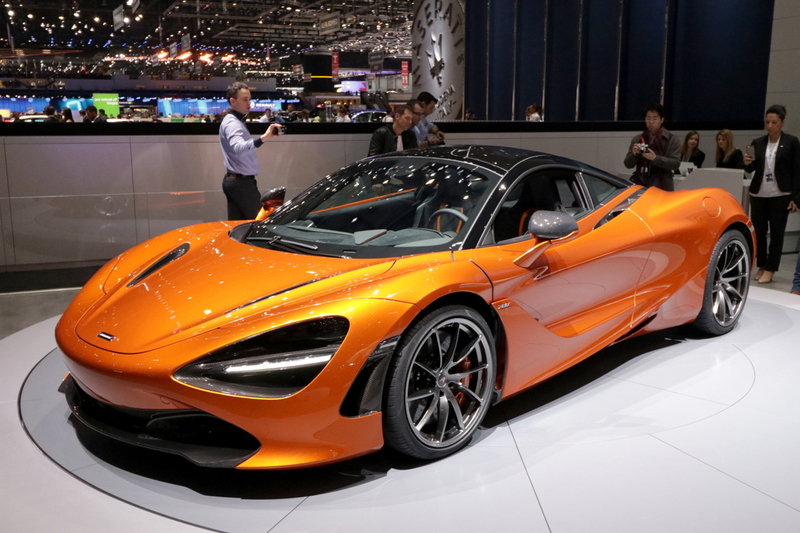 The Geneva Motor Show is the most important in the European calendar. The industry crossroads, the point where everyone (and their entourage) rock up and where we're usually guaranteed the biggest single number of car launches. And 2017 was a bumper show, with everything from a new Ford Fiesta to a new McLaren (and everything in-between) launched here. The replacement for the 650S - nee MP4-12C, or McLaren's older car. The new Super Series vehicle sees McLaren going for a more complex, emotional set of forms with aero-details a go-go. It's got 710bhp, and runs to 212mph. It's a busy design that's full of drama: centrally hinged doors are spectacular, the C-pillar's see-through, the front lamp is wild and the interior feels like sitting in a space ship - complete with fold-away, two mode gauge cluster. McLaren just made Ferrari's life a lot harder. Ferrari seems to be playing a silly name game. After LaFerrari ("The Ferrari") we now have the "Superfast". Mind you, with 789bhp from its V12, it will be exactly what its name says. Ferrari's front engined super-GT has lost some of clarity of the F12 it replaces. It's a very complex design with aero playing a massive role, like the McLaren (above). Word on the ground is that Ferrari is missing the Pininfarina influence. Oh, and it doesn't get the new 10-inch touchscreen of the GTC4 Lusso. There is a passenger side dedicated display though. We covered the Velar at its Design Museum launch in London, but Geneva was the first chance to see it surrounded by other cars and in different trim specs. It continues to impress, creating a new niche in the SUV space, brining some exciting new colour and material design to the party and debuting an attention-grabbing double touchscreen interface. This exterior-only concept is a complex beast, showing an intention for Merc to extend the AMG-GT line into a four-door coupe, but also mate the AMG sub-brand with its new "EQ" electric operation. It's also ushering in a new, crease-free design language. Painting it red and giving it flush door handles has helped create just one impression though: Merc's been studying Tesla. Hard. Audi's A5 coupe has already had the convertible and Sportback treatment. Now the hot "S" (Turbo V6) and "RS" (Turbo V8) models arrive. Piling on the facial aggression in a way only Audi knows how, the interiors continue to be peerless, Quattro remains a staple and M3-boasting performance should be a given. Lovely stuff. Looking distinctly unfinished in Geneva, the Valkyrie nonetheless made a splash. It signals Aston's plan to create a race-car-for-the-road by 2021, and it's being designed in conjunction with Red Bull Racing and race engineer Adrian Newey. It'll be very limited edition, making it perhaps the most exclusive of the new breed of hyper cars. Need space for the family but don't want a Porsche SUV? Well you can basically now - for the first time ever - have a Porsche estate. Except it's not called an estate - c'mon, that's far too common-or-garden for Stuttgart - the angle of roof and rear screen mean it reads more like a long hatch. Engines are the same as the regular Panamera, which means hybrids and V8-turbo petrols plus a diesel, and you get the same impressive but massively complex in-car tech screen setup too. If the Range Rover Velar is a car you want, the Volvo is probably the car you'll buy. Feeling significantly more premium than its Audi Q5 or BMW X3 competitors, the new XC60 utilises the SPA platform (as under the XC90) and keeps the Swedish-strong design themes going in a smaller SUV segment. Not heard of Alpine before? That'd be no surprise because the Renault-owned sports car brand effectively died in the 1990s. Renault is resurrecting it here in the hope of competing with Porsche. Rear engined, rear drive and with a new, 4-cylinder turbo engine said to be making close to 300bhp and not related to anything in a Clio, it's quite a retro car - referencing Alpine's greatest model of the same name from back in the 70s. Shown as a concept at the Paris Auto Show, the new Type R arrives hot on the heels of the boggo Civic. It still looks wild (like, driven through Halfords wild) but with independent rear suspension, and 316bhp it should drive better than before. Sales start in the summer. We expect it to cost £32k. Britain's favourite car got a refresh back before the turn of the year, but this is it's public showing. Unusually for the Fiesta, it retains a similar design theme to the old car, and unlike others in its segment you will still be able to buy 3- or 5-door versions. The premium sporty-ness is delivered with new Vignale, Active, and ST-line trims, while the ST (pictured) arrives from the get-go, with a new 3-cylinder turbo engine. Interior is the area which gets the greatest modernisation of all, though. Overshadowed by the news of Opel/Vauxhall's sale to PSA (Peugeot Citroen) the new Insignia is Vauxhall's new Mondeo competitor. It's handsome, in a generic kind of way, majors on space and is said to be massively refined. It's loaded with tech too: including the touchscreen from the Astra, but features like a full projector HUD, plus driver-assistance systems feature heavily. Three body styles will be available: saloon, hatch and wagon. The first car from the VW's group's "B" segment platform (VW Polo, Audi A1 and Skoda Fabia will all use it in coming years), the new Ibiza isn't exactly radical. It adopts a Leon-lite design theme, while packing in more space and new touchscreen tech. Porsche tuner Ruf's legendary "yellow bird" was a breathed-on 911 whose formidable reputation was made in the 80s. In a quiet way, Ruf stole the show here by recreating the 964-era 911, in "yellow bird" format. While that design actually dates from the 80s, this is a brand new car, built from the ground up, out of carbon. A clear attempt to one-up newcomer Singer, which currently owns the market for special, modified, historic 911s. A sister car to the EXP10 coupe (the green one) shown previously, this open-top, EV-powertrain concept seems to suggest Bentley is going to produce a car that sits below the Continental GT. We love the interior with its cut-glass screens, OLED panels, aluminium with wood and oxblood red leather. Piece de resistance? The "Rocket" buttons on the top of the steering wheel. This is Citroen's upmarket DS brand's first SUV. It's a join-the-dots exterior design, lifted by utterly bonkers details that have escaped from a concept car (headlamps that swivel through 180 degrees). The money's gone on a plug-in hybrid power train, and an interior that's like walking into a Parisian Boudoir (which is available in five different, opulent "worlds"). Passat not fancy enough for you? Audi A5 Sportback a step too far? Then you'll be needing an Arteon - effectively VW's replacement for the Passat CC; and a busier, more emotional piece of design than we're used to from the German brand.